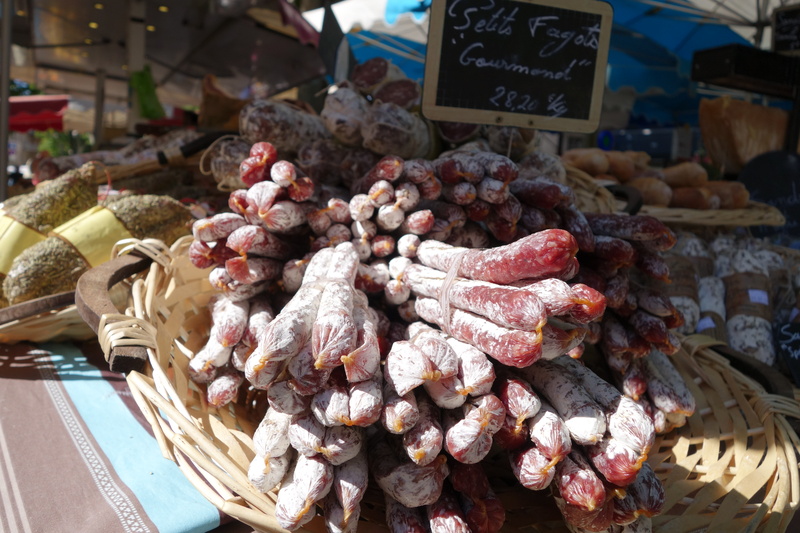 They are used to picky foreigners in the markets in and around Aix-en-Provence. There’s always someone wanting to know about the life of the slaughtered chicken they want to buy. Did the chicken house have indoor-outdoor flow? “What’s English for ‘free range? '” you’ll hear one vendor say to another. Did the chicken have a balanced, chicken-free diet? And local? Was its carbon feather print the size of a small chicken or an enormous pterodactyl? “Oui, c’est de la region – juste à coté d’Aix [Just down the road},” they’ll say agreeably. In fact, market vendors are so agreeable that a cynic might wonder if they are simply providing the correct answers to questions they consider to be quite pointless. So I wasn’t surprised to see bemusement on the faces of several butchers in several different markets and meat stalls when I asked whether their fresh or dried sausages contained preservatives. “Mais non madame,” they responded with the same smile. Comedians each and every one of them. It was a video I stumbled onto on Youtube that informed me of my mistake – a common one, as it turns out. You see the word préservatif means condom in France. It does not mean conservateurs – the chemicals used to extend the shelf life of food. That’ll teach me for trying on English words with a French accent (although it often works!). I swear that I asked that question of at least six butchers over a period of months before I learned my mistake. Not one of them pointed out my error. Instead they all promised deadpan, hand on heart, that their sausages were 100 per cent condom-free. That’s so funny Karen! I seem to remember getting a similar smile in a restaurant when me and my sister-in-law said we couldn’t possibly eat more because we were so full. It turns out we were saying we were pregnant. Finally… catching up with your blog Karen, on a warm overcast Xmas morning in Auckland! What a delight! Leo is especially amused, and wants to read it all – but I told him we’d leave some for tomorrow and the rest of our (long awaited) holidays :-)! Lots of love and Merry Xmas to you and the boys! !